Risk aversion returned to the markets last week following a brief spell of a recovery. Britain remained at the core of the market focus as deteriorating economic sentiment saw many investors rushing to pull out their investments from the hedge funds which had a high exposure to the sector. This snowballed into the global market sentiment falling as a result. Three open ended property funds had to suspend trading and also prevent investors from divesting. Needless to say, the sterling got hit with the declines accelerating after the Bank of England announced cuts to its capital buffer requirements. 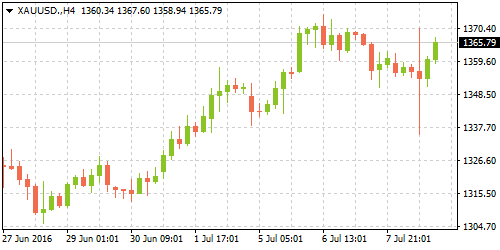 Gold prices emerged on the top this week, with prices in spot gold seen testing 2-year highs above $1375 during the week. Economic data from the UK was mixed with services and construction PMI falling to 7-year lows in June. Although the surveys by Markit were conducted well ahead of the June 24th referendum verdict it was clear that UK businesses are expecting to see further slowdown impacting the overall economy. Industrial and manufacturing production was however the silver lining, falling 0.50% each, less than forecast in May. April’s upward revision managed to put the year over year increase on a firm footing. In the US, economic data this week saw the ISM non-manufacturing PMI rise to a 7-month high. The data released by the Institute of Supply Management saw a broad based strength continue in the services based sector with the employment sub-index also see rising strongly and moving above the 50-level indicating an expansion. The ADP private payrolls report for June showed that the US economy added 172k jobs which were more than what was forecast. Small and medium sized businesses were at the forefront, but on a sector basis, manufacturing and construction saw job losses. Friday’s jobs report showed a solid job growth in the US. Data from the Bureau of Labor Statistics showed that the US economy added 287k jobs in June, more than the forecast 180k. The unemployment rate rose to 4.90% on increased participation rate. The coming week will see the Bank of England and the Bank of Canada convene for their monthly monetary policy meetings. After staying on the sidelines for nearly two years, the Bank of England's monetary policy meetings will be coming under investor scrutiny post-Brexit. Over the past two weeks, Governor Carney has been consistently stressing on the fact that rate cuts and QE expansion are the likely responses from the central bank to stem the currently deteriorating financial conditions in the UK. To this extend, the BoE released its Financial Stability Report last week where it lowered the capital buffer requirements for banks to zero percent from 0.50% previously. This led to 160 billion British pounds being eased up for the banks which are expected to boost lending. 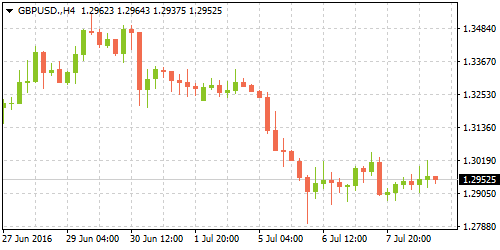 While the BoE will release its full and final assessment only on August, as stated by Carney previously, this week's monetary policy meeting is likely to see the dovish rhetoric continue putting downside pressure on the British pound. Expectations also call for a 25bps rate cut this week. The Bank of Canada will be keeping rates unchanged following no major deviations on the economic growth over the past month. Inflation is the exception to the case, falling 1.50%, from 1.70% previously. Still, the BoC could brush aside the fall in inflation last month and maintain a neutral stand. Other economic data over the week includes the US and China inflation data due for release over the week. Australia will see the release of the monthly labor market data over the week, but broadly, the markets will remain tuned to developments from the UK.